I am going deaf. Not particularly quickly, mind you. I probably have decades of hearing left until I succumb and have to depend on technological assistance to hear. But I am going deaf. I've known it for about five or six years now, since I first noticed that I couldn't hear myself singing like I used to. Then I found that loud noises made all the sound in my right ear turn to loud static and sharp shooting pain. A little after that I started to experience fadeouts. And in the past year my left ear has started doing the static thing to. I'm not telling you this so that you can pity me, I'm saying it because I want you to understand where I'm at with it all. I'm not particularly fussed about it, honestly. Back when I first realized I was going deaf I was pretty upset - I put a lot of stock in my musical ability and I thought I might someday want to be a singer. I can't do that now. And, really, that's okay. I've found other things to love, other lives to live, and when the time comes and I fully lose my hearing - probably when I'm in my forties or fifties - it won't be the end of the world. But I will say that it was hard to get to this point of acceptance and comfort with my hearing loss. The first couple hundred times you have to ask someone to speak up because you very literally cannot hear them are embarrassing. Especially when you're telling a scared teenage girl that she needs to speak her fears much louder because you can't help her if you can't hear her. It was hard not just because adjusting to any new life change is hard, but also because out of all the stories you see in pop culture, representation of characters with substantial hearing loss is pretty much nonexistent. If you don't believe me, I'd like to do a little thought experiment: I want you to close your eyes and name a movie or TV show about a character who is blind. Got one? Okay. Personally, I always think of Scent of a Woman first, despite the fact that I've never actually seen that movie, nor am I particularly inclined to do so. Now, next I want you to think of a movie or TV show that features a main character who is noticeably physically disabled. Got it? Is it X-Men or My Left Foot or something like that? Right on. Now I want you to close your eyes and think of a movie or TV show where the main character is deaf. Now, I'm not saying that there are no movies or TV shows with deaf characters. There are, and some of them are pretty good. But I am saying that compared to the way that our culture talks about other forms of disability, deafness is weirdly invisible. And that's dumb. Not just because it's a relatively common form of disability, but also because there is literally no reason for this. And yet when I think of movies or TV shows that deal explicitly with deafness, I can think of a couple of guest stars on episodes of Law and Order, Mr. Holland's son in Mr. Holland's Opus, and Marlee Matlin. Also this German movie I saw once. So when I, as a woman in her early twenties, realized that I was slowly and inexorably losing my hearing, I looked to pop culture for an example of what that would be like. What was it going to be like to be deaf? What is deaf culture like? Who am I? And instead of finding something helpful, I found the Very Special Glee episode where the kids meet a glee club from an all deaf school and proceed to sing a touching duet with them where the hearing kids' voices are pitched to cover over the "embarrassing" and "awkward" sounds of the deaf choir. I'm still pretty pissed about that. All of this, however, is just a long intro to bring up a fact that I discovered in my panicked research. Because, as it turns out, there is one character in pop culture that can show me what it means to be deaf in a hearing world, and even what it means to be deaf and still very very capable. That character is Hawkeye. Heck yes, Avengers Hawkeye! 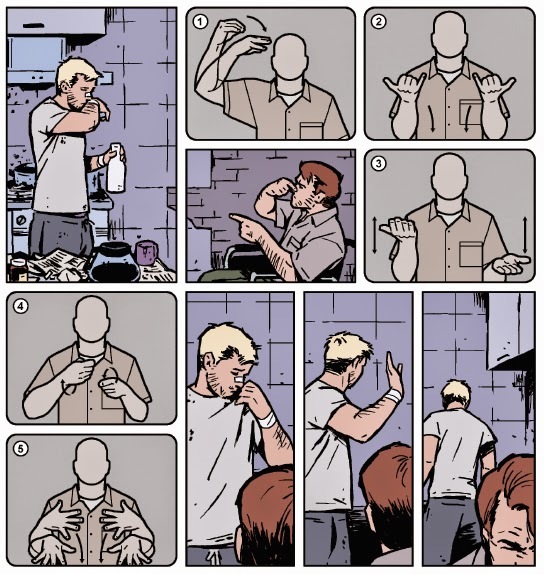 Clint Barton from the Marvel comics is canonically deaf, and it's kind of my favorite thing ever. Now, granted, we don't yet know whether or not the film version of Clint Barton, as played by Jeremy Renner, is deaf, but we do know for a fact that current comics Clint is. It's been mentioned multiple times on Matt Fraction's Hawkeye, in Hawkeye vs. Deadpool, and I think (but I'm not sure on this one) that it's come up in Secret Avengers. Point is, Clint Barton in the current Marvel comics canon is nearly completely deaf. 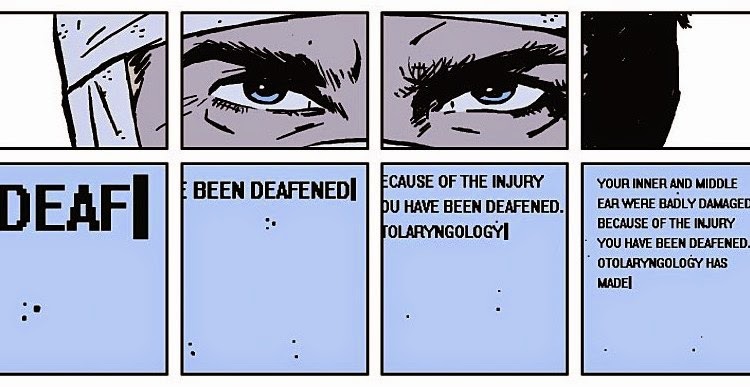 The origin of his deafness varies a little bit - sometimes it's because he stood too close to an explosion while working for SHIELD, othertimes it's something that happened in childhood, but the point of the matter is simple: Clint Barton has near complete hearing loss, and yet this in no way prevents him from being an awesome superhero. This is a big deal. It's established that while Clint can hear pretty well if he puts his hearing aids in, they're not infallible, and sometimes they break or need new batteries or he forgets to put them in or whatever. The point is, it's not hand-waved away. Clint is deaf and it impacts his life. It does not, however, make him any less of a badass, and one has to assume that this is an intentional narrative choice. I mean, how easy would it be for the writers to give Clint a cochlear implant? Or have Tony Stark build him hearing aids that never stop working and are surgically attached to his ears? He works for SHIELD. SHIELD could easily be persuaded to make sure their asset is never compromised in the field. But the writers haven't done that. They haven't let us forget or not care that Clint is deaf, but neither have they made it an insurmountable obstacle. Instead, they've chosen to go the best possible route: reality. Because here's the thing: there are only certain circumstances in which my hearing loss actually affects my daily life. By and large, I can get by. And even for people with complete hearing loss, the kind that even hearing aids can't help, it's not like life is impossible. Heck no! It's just life, with a couple of extra hurdles in the way. It's not like the comic goes deep on this, but there are little moments. 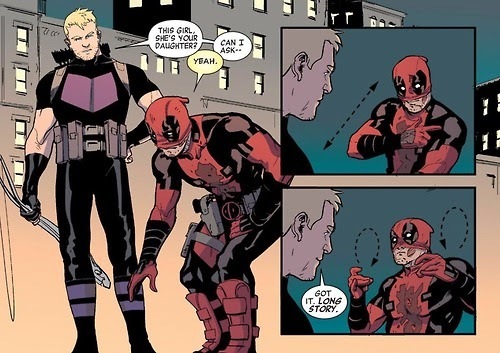 In Hawkeye vs. Deadpool, Clint forgets to put in his hearing aids at the beginning of the night. He's then forced to work with Deadpool, whose mask covers his face entirely, and Clint can't hear him or read his lips. The solution? He literally just tells Deadpool this, and Deadpool rolls his mask up so Clint can see his mouth. That's it. Problem solved. This also comes up when he's working with Spiderman too, and again the solution is the same. See, being hearing impaired doesn't make Clint unable to be a superhero, it just means he has a couple of workarounds to use. It's worth noting too that Clint's disability really doesn't have any impact on his superpower. Or rather, his lack of a superpower. He's a great shot not because he's deaf but because he's a great shot and also happens to be deaf. He's not Matt Murdoch in Daredevil whose disability very literally is his superpower. He's just a guy who is deaf and also very good at a thing. And I know it sounds weird, but that's really comforting. What I got from looking at Clint was an assurance that while going deaf will affect my life (and already has), that doesn't mean my life is going to be worse or that I won't be able to do any of the things I love to do that I know I'm good at. I'm not going to fall into some netherworld of the deaf community that exists without contact with the world upstairs and never be seen or heard from again. I know that sounds a bit dumb, but what else was I supposed to think? There are barely any deaf characters in pop culture, and even fewer who are doing the thing that they love to do happily and well. I mean, I can think of that one guy from The Replacements, but that's about it. And this is just dumb. Seriously. Super dumb. It's not like deafness is all that hard to portray in movies or television. Sign language is gorgeous to watch and surprisingly intuitive to understand. And for the audience members who don't know ASL? Subtitles. Seriously. It's that easy. 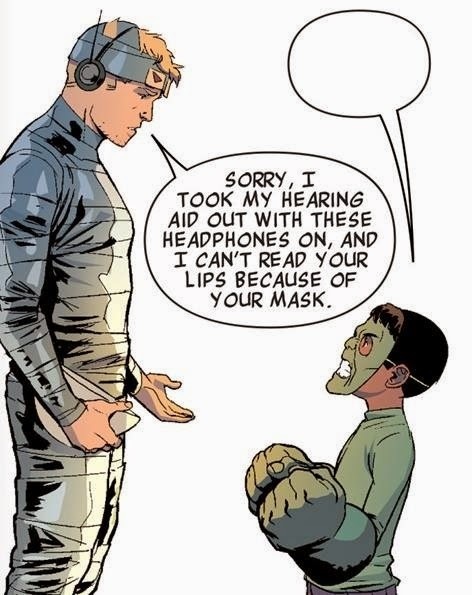 It's interesting that of all the media in the world, the one that's best at showing deaf characters (or at least the one that has deaf!Clint Barton) is comics. Comics are uniquely suited to portraying deaf characters, because they're an even playing field. Deaf and hearing readers get the same experience. But it's also cool because comics are visual. They can literally show the sign language and still convey plot. I'm just saying, it's pretty neat. But this doesn't let TV and movies off the hook. The problem with the complete lack of representation of deaf characters is that as a person freaking out, I had no image to show me what I could expect. The lack of representation suggested to me that in becoming deaf I was going to become completely alienated from pop culture and society as a whole. And it's completely stupid because I patently know that's not true, but it haunted me anyway. Now, I wouldn't go so far as to say that my experience stands in for the experience of everyone fearing the loss of their hearing, or even that I have a particularly enlightened or informed understanding of hearing loss. But I do know that Clint Barton brought me comfort when I desperately needed it, and for that I'm pretty stinking grateful. In the end, that's really all you need to know. Wow. I didn't realize he was deaf; I'm glad you have someone to show you the way. I kind of needed to read this right now. I have some hearing loss.. Not devastating but enough that it makes some social interactions awkward, and I have to rely on others to know if something is wrong with my car. I'll note that The Guiding Light had a deaf character, Abby, but they eventually went the cochlear implant route with her. I've never watched much Guiding Light, but that's really good to know. Also interesting how there's so much pressure to "normalize" deaf characters. Oh man! The car thing gets me every time, because in addition to the hearing loss, I also know nothing about cars, so when my car makes its death rattle to start up, all the hearing people around me shudder and step back and I can't figure out if it's because they hear something I don't or they're just being wusses. Oh my gosh. I am going to buy that book and cherish it forever thank you so much. Excellent article. 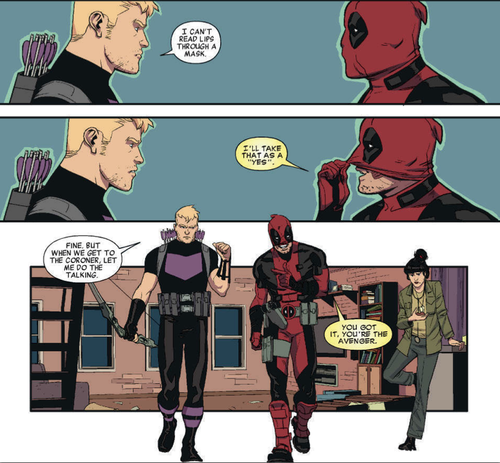 I love Hawkeye at the moment and Deadpool has always been my favourite. I haven't gotten around to watching Fargo yet, but that's a really compelling argument! I would love to see someone crack jokes in ASL. I've seen it in real life, and I love it, but I never get to see it in movies or TV! Gonna definitely have to check this out. Switched At Birth on ABC Family is about two teenagers who were accidentally switched in the hospital as babies. One of them is deaf, and a good part of the show dialogue takes place completely in ASL. I've vaguely heard of this show, but I'd never seen any details. That sounds really interesting, I'm going to have to watch that. Thank you so much for the tipoff! I really hope they do put it in, though. Because I completely trust Jeremy Renner to pull it off and it would just be so wonderful. I've never heard of that - sounds super cool!